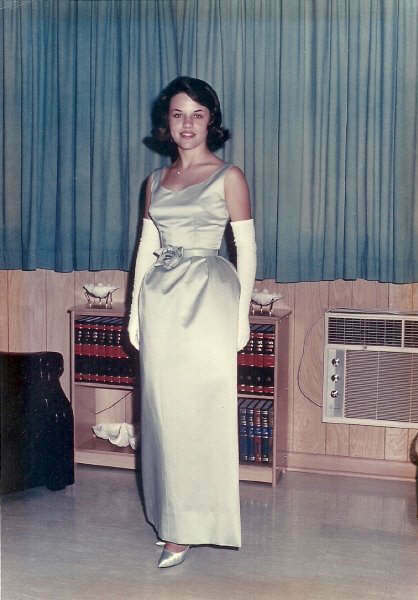 Not the woman, we know who the woman is — it's C.'s aunt, and this was a prom gown she thinks was made by her grandmother in the 1960s. She's trying to figure out what pattern it was made from. If your mind is better-filed than mine, and you know what this pattern is (or can make a good guess) want to leave a comment? Simplicity 5718 is close. I have it in my store at http://www.vintagefashionlibrary.com. I also meant to add that Cs aunt is smokin in that dress! Both patterns are similar… Simplicity 5718 has the released darts in the skirt, but Cs aunts dress has a deeper scoop neckline… the McCall 7057 has a gathering on the skirt and Cs aunts dress is not not gathered. What a stunning dress.. with the shoes and gloves. She has a lovely figure and looks gorgeous! Vogue 5767 looks close too. This would have been a fairly popular style in the 60s, so its likely that there are several patterns out that would be close. It could also be a frankenpattern as another poster suggested.Pretty dress, and the wearer looks gorgeous! I love the color she chose – looks great in the satin finish. I think the key to this pattern is the flower at her waist. That would have to be included in the pattern. Wow…those pattern-picture waistlines DO exist in real life! Sandritocrats Vogue 5767 does look very close. McCalls 6571 might also work, although Im not sure about the darts on the skirt and the neckline might be a bit lower. Wow, such class! looking at pictures like this is like eating comfort food…it gives you a warm glow and you think that nothing bad will happen to you! Thanks for sharing. I did see this pattern somewhere…hmmm…and I think Jackie Kennedy wore very similar syles often. That photo is like a visual time capsule! Every detail – the oufit, the hair and makeup, the paneling, the flooring, the bookcase contents, the flooring, the chair – says 1964 to me.Now if the actual photo is displayed in a thin, goldtone frame – that will be the final touch! and dyed to match shoes–or is the dress white. Im 60 and she must have been at my prom! Does it have a sweetheart neckline?I admired the totally period look of the photo, too. I love the display of shells from the Florida vacation. It was the vacation at that time. As SOON as I saw it, I thought gah! The McCalls Day to Night one that Tina posted (McCalls 7057). The neckline, the waist seaming, the slightly belled hips.. thats my guess, too! Try these Butterick 2905 and 2489. Great dress – Looks like my Simplicity pattern 6353 (1965). Cant help with the pattern Im afraid but just wanted to say wha ta beautiful dress/picture that is! Tiny waist, full hips, fitted midriff — Id have killed for that pattern in 1959-62. After that I had babies and lost the 22 waist. Im telling my age, but I had a dress very similar to this one in 1966. It was a Vogue pattern my mom made for a winter dance. The back had a low scoop. I felt beautiful in it! This is the pattern used for my wedding gown, but had a lace jacket over the top. It is still in my closet in a plastic bag since l964. Maybe one of my granddaughters might think it is neat some day.